If you had asked me even six months ago about the sort of colours I preferred, I almost certainly would have talked about subtle colours. I would have mentioned the brown and tans of earth, sand and clay. In paint terms the umbers, burnt or otherwise. I would have explained that I had a liking for those colours which you can’t quite identify, such as those in this 2006 painting Paragon by Peter Doig. You are not quite sure when looking at the orange area in the centre, if it is indeed orange, or perhaps brown, or partly purple. If you look at the purple areas, are they really purple, or green or perhaps blue or grey? I probably would have spoken of the colours used by Gaugin. 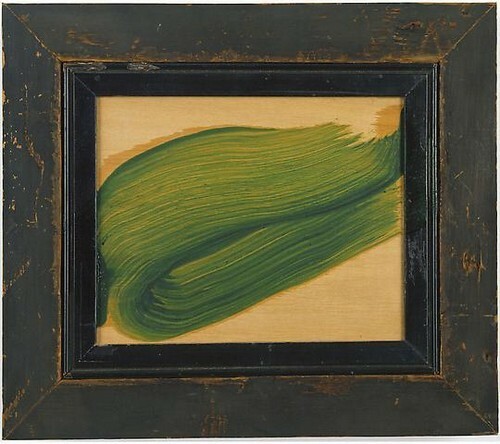 Or among contemporary artists by Howard Hodgkin, who with just a swirl of green paint, can encapsulate leafiness. The thing that all these artists have in common is that the colours they use, whilst vivid, are nonetheless subtle, nuanced and mellow. Then a few weeks ago I visited the Museum of Modern and Contemporary Art in Nice to see the works of Yves Klein. I have always liked on screen, or in reproductions, the colour that he patented as Klein Blue but I am not certain that I have ever seen the real thing before, though I feel I must have done. But reproductions don’t do the colour justice, because however blue it looks in photographs, it is even bluer, deeper and stronger when you see it . What is more it looks nothing like sea, or sky, or anything natural at all. The very unnaturalness of it, is what made it interesting, particularly when coupled with something that was genuinely natural and organic, as in his sponge reliefs. 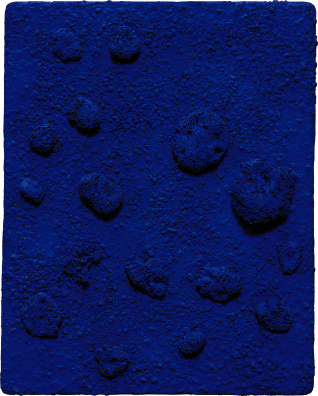 It is extraordinary to think that Klein made this particular sponge piece in 1960, the year he patented his colour. At over 50 years old, it shows no sign of fading. There is nothing subtle about this colour at all. It is whack you in the face colour – blue and proud of it. The Klein works got me thinking about colour and about embracing the unnatural, and indeed how often artists do use colours that may not be unnatural in themselves but are used in unnatural ways. In the Gaugin painting above, the dog is orangey pink; the land is purple; one of the women is actually a lightish green. So I was interested to learn that the National Gallery was holding an exhibition Making Colour. Advertised as being about “the surprising materials used to create pigments and the incredible journeys made by artists in their pursuit of new hues” it sounded fascinating. In a way it was. Whilst there was much that was interesting there, overall I was disappointed and felt they failed to exploit the possibilities to the full. It was such a good idea but there were so many opportunities missed – so many gaps. Perhaps it is unfair to question the choice of paintings but they did not seem the most exciting possible even allowing that the exhibition examined only pigments that were used between the Renaissance and the Impressionist movement.While this enabled the gallery to make use of the paintings that were in its collection, and not have the bother of arranging loans from other galleries, it still left the story unfinished. There was a bit about colour wheels and complementary colours, which incidentally provided an opportunity to show this rather fantastic picture of crabs by Van Gogh where the greens of the background and the orangey shells of the crab work so well together. After that, there were rooms devoted to each of the colours: – blue, green, yellow, red, orange, purple and, strangely, gold and silver which are not colours at all, and which sidetracked the exhibition into the art of gilding. In the Green Room, I was struck by this North Italian Painting of a Woman at a Window chosen to demonstrate the use of green pigment. Unknown: Woman at A Window (probably 1510-30). 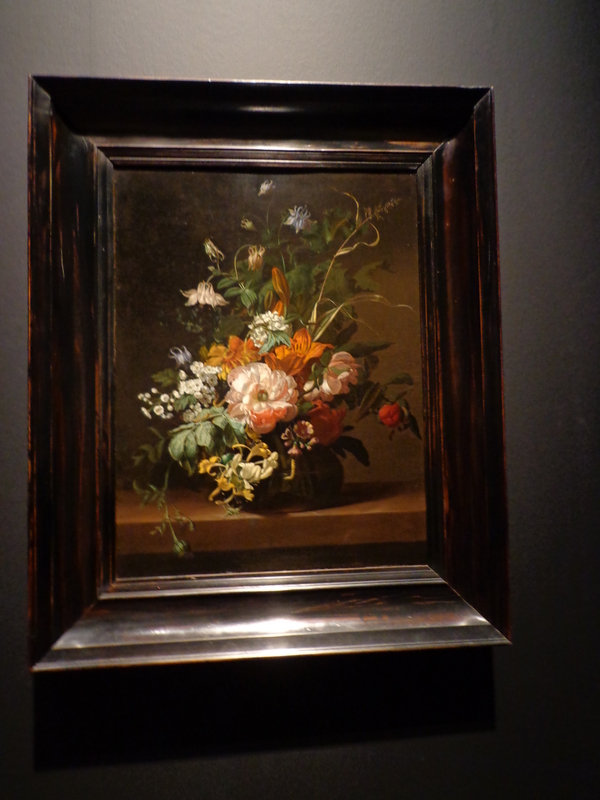 I was interested to learn that the orange used by Rachel Ruysch in the lilies below was derived from arsenic and highly poisonous. But with no rooms devoted to black or white there was no discussion about the use of Cremnitz White, which is made of lead carbonate, no longer available in tubes, and used by preference by Lucien Freud and of course none of the white or black paintings by Robert Rauschenberg . In the red room there was this striking unfinished painting by Degas Combing the Hair which possibly seems more interesting because it is unfinished. 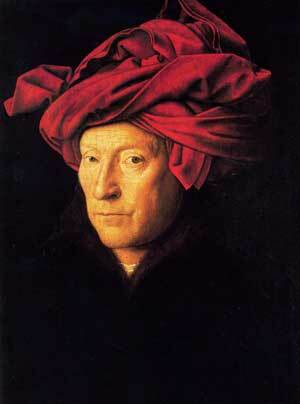 But if you have a room with red paintings, surely you would want to include this marvelous Van Eyk face, Man in a Red Turban ,assumed to be a self-portrait, and which is in the National Gallery’s own collection and provides a splendid example of the use of vermilion. But the most interesting part of the exhibition turned out to be not the paintings at all, but a film discussing how light falling on the retina is interpreted by the brain as colour. This was fascinating stuff and demonstrated through the use of optical illusions how the brain conjures what we see, not only from the interpretation of light falling on the retina, but also by our memory of what we seen before. This, extraordinarily, means that a for a short time, until the brain realises its mistake, we can see a scene in colour that is actually in black and white. It is worth a visit just to see this effect. I would have liked more. So overall a mixed bag. Worth going? Definitely yes. It just could have been so much better. With the cut off point the end of the Impressionists, there was nothing about fluorescent paint which was invented in 1932 . Definitely nothing about Klein Blue; no Doig or Howard Hodgkin; nothing about artists such as Carlos Cruz-Diez who paints with light in his Chromosaturation installations. 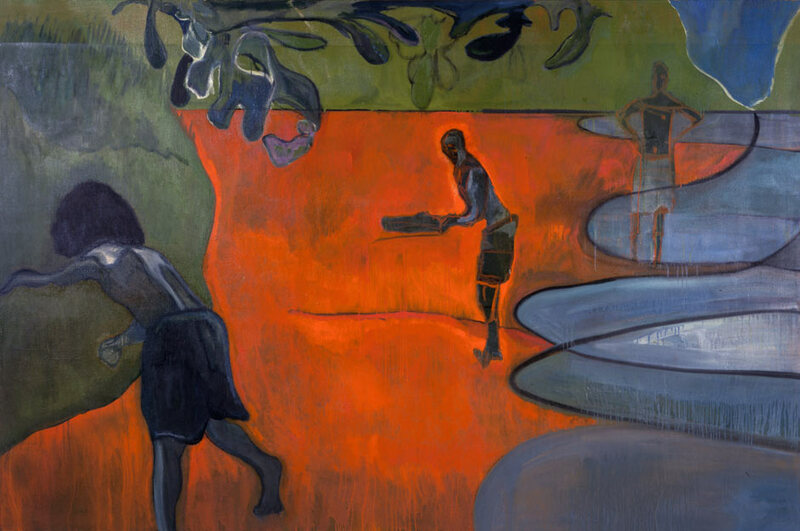 But, oddly, the exhibition did feature one brilliant, blue example of contemporary art – brilliant in both senses: very brightly coloured – very clever. In the Blue Room was a small fragment from Roger Hiorn’s installation, Seizure, which was created in an abandoned flat. 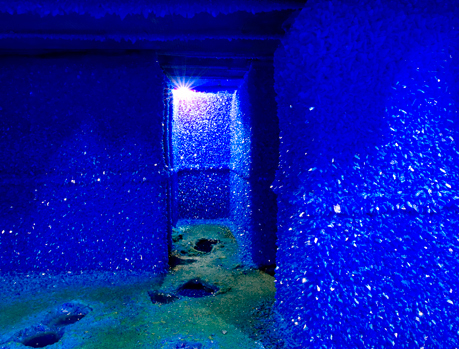 Hiorn encased the flat in watertight metal, and poured in 90,000 litres of heavily saturated copper sulphate solution through an opening in the ceiling and left it to react for just over a month. The result judging from the photographs, and the small rectangular sample the exhibition had on show, was a wonder. It also demonstrated just how more wondrous the National Gallery exhibition could have been, had it not stuck so fast to its core expertise.